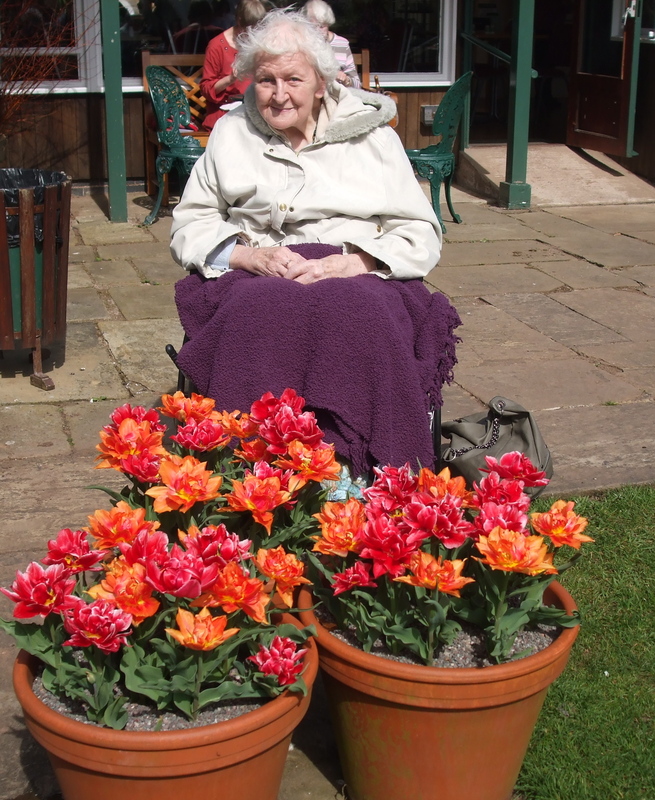 Mum is 86 and since July last year has been living in residential care. 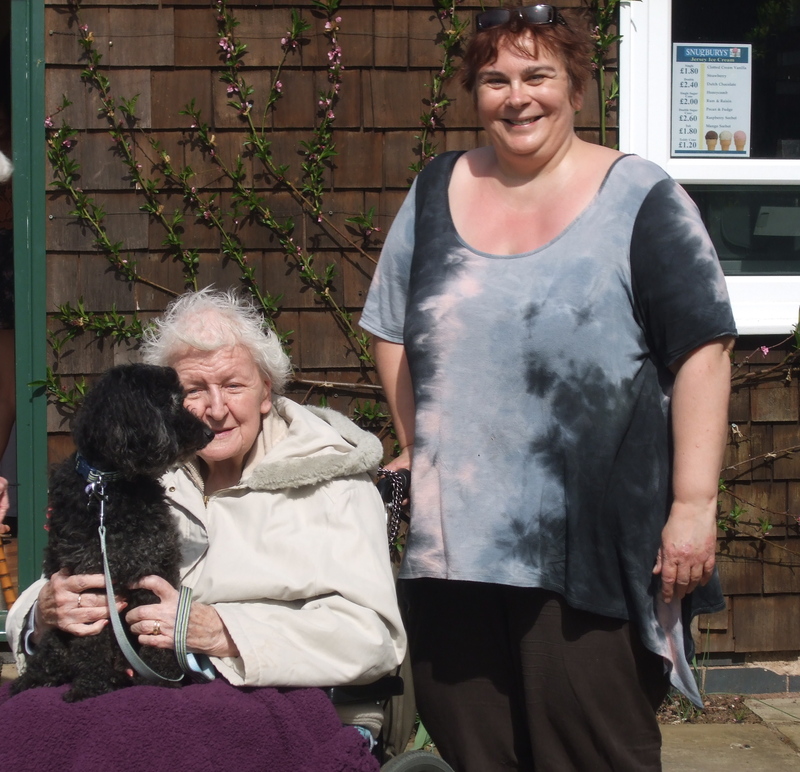 She has dementia and her memory is poor but her sense of fun, love for cake and enjoyment in family and any trip anywhere remain.She is nearby so we can visit often and we can take the dog Mr G. for cuddles for both of them. Don’t ask questions- expecting her to remember what she did yesterday is just daft and upsets her. The only questions permissible are in the present tense, are you warm enough, would you like tea or coffee? Or some days we can chat happily about her childhood or earlier days, it varies. Taking Mr G always works – dogs do the work for you. He loves a cuddle, is always affectionate, never argues, asks difficult questions and will sleep in the sun. Perfect. Visits from ‘the boys’ her grandsons light up her day, and they have become experts at the list above and amaze me with their maturity and perception. 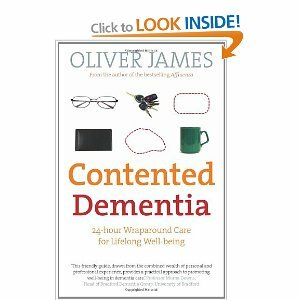 Oh and one of the best books I’ve read on the subject is ‘Contented Dementia’ by Oliver James. Woke early this morning to birdsong and light filtering through the blinds. It is Spring Equinox today and everything seems to be stirring and budding and getting ready to shoot and grow and blossom. I can feel it too, those stirrings of energy and urges to move, change, live. I overdid it a bit yesterday in my enthusiasm for the great outdoors. I suppose after 3 weeks of inactivity a 10 minute walk would have been better than pottering about for an hour, enthusing over each flower. Sometimes I can be a bit too all or nothing, I like to think this is part of my charm but I also know its part of my recovery to ‘take it easy’! So today I have a sort of spring cleaning plan, but one that involves having my leg propped up on the sofa with the requisite number of cushions to take it above hip height! The dog and I have had several discussions about this over the last few weeks, especially as he is sure that all cushions are his personal property, as also is my leg. So we have had to come to a compromise of him lying next to me on the sofa, with occasional shoving in both directions for space! Having said that there is nothing like a shaggy dog companion to cuddle up to when you are feeling a bit down. Anyway back to the spring cleaning story! Last night I was looking for a letter than son 3 needs for his trial visit to Durham Uni this week. I just ‘know’ it was in one of the piles of paper on the kitchen table. Unfortunately the piles of paper get moved depending on the number of diners at this establishment ( literally a moveable feast!) and I ended up searching through several piles which had been moved to table 2 in the back room. Ahem. Now I know I’m not the only one who has this paper moving issue but in a short space of time I found several things I had forgotten about, the Census ( UK), an online prescription service from our Dr ( didn’t know that! ), son 3’s driving license, a hospital appointment etc. So my task for today is to take said piles of paper, shredder, box files and spend a happy time organising, filing and deleting as required. And all with my leg up! Over 12 months of depression has contributed to the paper mountain of course, inactivity, isolation and forgetfulness all being part of the cycle. It will be fun to turn some of this budding energy into reclaiming little bits of my life.